Do you believe in a flat or spherical Earth? Why or why not? I admire people who can change their minds based on information. This is a most rare attribute for anyone, regardless of background, education, or politics. 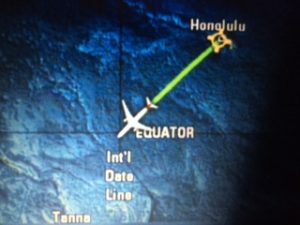 As I just glimpsed up to at the flight monitor for the first time in our flight from Honolulu to Sydney, I was surprised to see we were roughly about to cross an important but imaginary intersection: the convergence of the IDL and the equator. I recall spending one night on YouTube investigating the claims of Flat Earthers and almost being convinced. But when you think about all the people who live according to different time zones that correlate with their relative position to the sun, it would be difficult to imagine alternative scenarios except that the earth is round, rotating and that we take turns facing the sun. Most people believe the Earth is round but it was not always so. The Earth was believed to be flat during the Dark Ages in Europe. But in antiquity, measurements of shadows when the sun was directly overhead in one location and cast an shadow in Alexandria at noon. 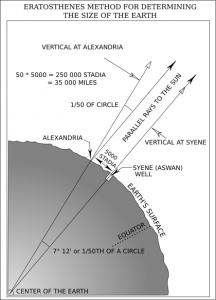 Egyptian Eratostothenes was able to accurately calculate the circumference of the world around 240 BCE. People generally accept the official version of reality and don’t question what others believe. Interestingly, the progressive left was once the champion of freedom of thought but in this time, it would appear that most on the left no longer subscribe to the notion of “I disagree with what you say but I will defend to the death your right to say it”. Most self-avowed liberals seem readily dismissive of any people who question climate change (formerly global warming), gun control, radical Islamic terrorism’s roots and scope, viral epidemics, etc. We have reached a moment in history where to even entertain the possibility of divergent ideas based on alternative information is considered an Orwellian “through crime”. One of the fascinating things about taking a telomerase activator is that the zeitgeber or time-giver inside out bodies gets very strongly entrained. I recall one night implanting the suggestion that I was waking up every 90 minutes and indeed, I did just that, to the minute, four times in a row. Such brief awakenings are not uncommon when taking a telomerase activator or adaptogen. Whenever I travel, I make sure to reset my circadian rhythm by getting daylight, being in contact with the ground, and taking adaptogens or telomerase activators. For more info, read this blog about circadian rhythms and synchronicity with an embedded link to a podcast that I did on the subject. I bought the book FLAT EARTH CONSPIRACY BY ERIC DUBAY. it impossible for me to view the islands due to earth’s curvature. According to the formula, the islands at 26 miles from Pacifica should be about 500 feet below the horizon. I can see all the islands using my powerful binoculars. I even saw a huge whale jumping from the water in front of the islands at the time a few weeks back. I cannot get past this tiny obstacle about the curvature of earth. Earth is appx. 8,000 miles in dia. appx 25,000 miles in circumference.